(Bloomberg) -- South Korean moms and pops are piling into exotic finance products with catchy names like “super lizard” and “double-chance.” Some even come with complimentary beauty products and department store vouchers. For an industry with a checkered past, regulators see changes afoot. The Financial Supervisory Service, the country’s top financial watchdog, said it will release an updated audit on these instruments -- known as equity-linked securities -- around the middle of April, and may consider recommending firms slow down sales. That’s after they sold a record 86 trillion won ($76 billion) of the notes last year. The effort has gained fresh urgency as a slide in global bond yields to multi-year lows further boosted the allure of the securities. Complicating matters is the tendency of the products to occasionally spark turmoil at the large dealer-banks which sell them. Appetite picked up last year after regulators lifted restrictions on brokerages issuing the notes. Buyers of the instruments favor their relatively high levels of advertised returns, and issuers pocket a commission when they sell a product and typically juice that with profits from hedges. Natixis SA said it was no longer creating the structured products in Korea after one type, known as autocallables, led to a 259 million euro ($292 million) loss at the French bank late last year. In 2016, Hanwha Investment & Securities Co. made a 192 billion won ($167 million) operating loss, more than half of which came from derivatives losses that analysts said were in part due to hedges that soured at the Seoul-based brokerage firm. 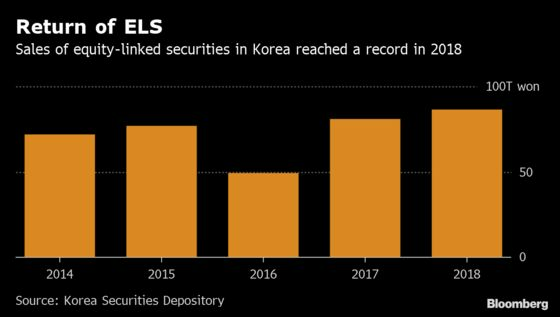 South Korean regulators have tightened rules on hedging for these instruments in recent years. Issuers are asked not use their own capital excessively for hedging, take on too much leverage and to avoid riskier assets such as real estate or high-yield corporate bonds, according to a statement from the FSS. About 46 percent of buyers of the instruments issued in Korea were retail investors, according to FSS data through June. The risks of that reliance on how one index performs was highlighted in 2015-16 when the almost 50 percent peak-to-trough slide in the Hang Seng China measure triggered losses for many holders. Sales suffered in 2016 as regulators sought to restrict sales following that market turbulence. Many ELS products have a “knock-in” level at which there is an increased possibility of investors losing money. Buyers of the instruments make money by receiving coupons at set intervals over the length of the investment. Their principal can be at risk if the underlying index drops below the knock-in threshold and fails to later rebound to a certain level stipulated by the contact. That was the worry at the start of this year for 62-year Cho Haeng-ran, who put $1 million into an equity-linked product -- an investment she thought posed little risk. 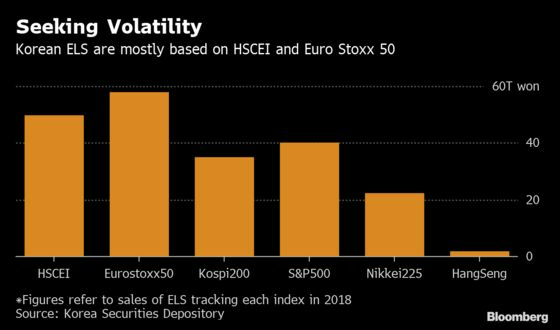 When stocks plunged late last year and the Hang Seng China gauge fell more than 10 percent from a level in early May, she was facing a loss. Equities since recovered, but Cho says she didn’t know that she could potentially lose money. A spokesman for Woori Bank, who sold the product, declined to comment. The use of ELS in South Korea dates back to 2003, though in the initial few years the investor’s principal was always guaranteed. Then in 2005 investors began flocking to products offering even higher returns -- without the assurance that you will get your original investment back. Advertised returns could then be as high as 10 percent annually while losses could grow to as large as 60 percent, according to the Korea Capital Market Institute. For issuers, it’s a tougher outlook after rules around hedging were tightened, said Lee Hyo-seob, a research fellow at the Korea Capital Market Institute. He’s watching out for what regulators do next.